Its was over 30 years ago and I only have my memory to go by so I may stand corrected on some of the details. It was one of the 281st’s darkest hours and I, at 20 years old, had to make one of the toughest choices of my life. We were working just outside the Ashaw Valley in March of 68. We had 8 ships shot down that day and lost McCoig. Here is that story, as best I can recall. 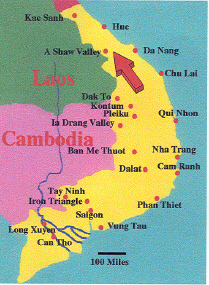 We were camped just south of Hue at Phu Bai and supporting a Delta mission near the Ashaw Valley (Ranger Valley I think) just before the Army's BIG push into the Ashaw. I had 5 months in country. I didn't like it up there because it seemed that most of our insertions were quite a ways away and always with a very poor 300 ft ceiling and only about ¼ mile visibility. the vertical fire and hopefully be shot down. It worked. As luck would have it they used up their clips on the first ship while I was in #2 (all three times) as we were coming out two at a time. Its a heck of a scary feeling taking off #2 and seeing lead go down. We regrouped, closed ranks, and went in for our last insertion. Again we were #2 coming out and again lead was shot down. When we got back to base and counted the numbers 8 ships had been shot down (at least one was a one ship which went down outside the LZ and they were all losor captured). McCoig had been killed instantly with a head wound. I believe all the ships with the exception of a Marine ship were downed either inside the perimeter or close enough so that the remaining crew members made it back to the LZ and got out on other ships. Of all the ships (ours and the Marine ships), so I heard, only two didn't take hits, ours and C&C. That night was the longest night of my life. We had well over 100 people down there and maintenance told us they might be able to get one more slick up for the extraction the next day. I was really hurting, McCoig was one of our best pilots and I really enjoyed flying with him. Just a few days prior he had called me “The Kid” in a different tone of voice that I immediately picked up on. In his eyes, I was no longer the 135-lb kid just out of high school but a senior peter pilot that was just about ready to become an AC. “The Kid”, later became my call sign. Good bye letters were written to my girl and parents and placed under my pillow as others were also doing. I didn't get a minute of sleep that night because my mind was going a mile a minute. As I figured it, we had only 2 slicks and maybe a gun or two to try and pull out about 150 people the next day under hostile fire. The odds sure didn't look very good and I pondered over and over what would happen if I refused to go. Would 20 years at Leavenworth be worth it? Robin Hicks was my closest friend and McCoig’s peter pilot. We had come into the unit together and he was now stranded down there and needed help. If I were in his shoes I sure would want someone trying their very best to come get me out. I made the decision to fight and unknowingly set in place one of the cornerstones of my character. This part is a little fuzzy but I believe we sat for a day while jet after jet and numerous Cobra gun ships pounded the perimeter. When it became time to try to get them out our ship was designated “rescue one” and circled a distant ridge line where we could see the entire area. That was our reward for getting through all that without a scratch. That was the first time I saw Cobras in action. I was amazed at how much ordnance they carried. They tore up the flats around the LZ. I don't believe a mouse could have survived there. Because of the direr circumstance we were now in a gathering of all the crew members was called. Volunteers were asked for to man a "test" ship that would go in alone. If it made it out OK then the other ships would follow. The word from the troops down there was that it looked as if the bad guys had pulled out. When asked for volunteers all hands in that tent went up, though some a bit slower than others. The “Test” ship was picked and our two best AC’s and most experienced crew members were chosen to fly it in. One was T.C. Miller. I don't recall who the other was. Most of our ships were still down for repairs but HQ had somehow acquired ships of all over the place including some “Baby Chinooks”, as we called them, from the Marines. We were all in position and T.C. was on about a 1 mile final when a jet came through the valley with wheels down and flaps extended. I had never seen a jet fly that slow and was wondering what it was doing so low. Just as the jet passed over the LZ out came a huge cloud of white smoke that floated right into the hillside that we had received so much fire from before, blocking their view of the extraction about to take place. After that, we received no more fired from that hill side. T.C. made it in and out without incident and all the other ships followed suit. I heard later that there were tunnels throughout that hill and the NVA knew if someone used that LZ, they had em. That's why the Cobras and our gun ships couldn't neutralize the hillside, when they heard the ships coming in they just pulled back inside their tunnel. On the extraction, one of the “Baby Chinooks” had gone down outside the immediate area. The other Marine ships tried their best to help. I later heard everyone was captured. One of the Green Beret down there saw a tall white man directing a portion of the battle for the NVA. One of the captured NVA said there were Russians there showing them how to shoot down helicopters. He taught them well. It was good to see Robin again. We later found out that Robin had gone back to the ship and retrieved McCoig's body even though snipers were trying their best to get him. He and another carried McCoig's body out. We don't leave anyone behind if at all possible.